The first two photos are of Lola prior to coming with us in her previous home. 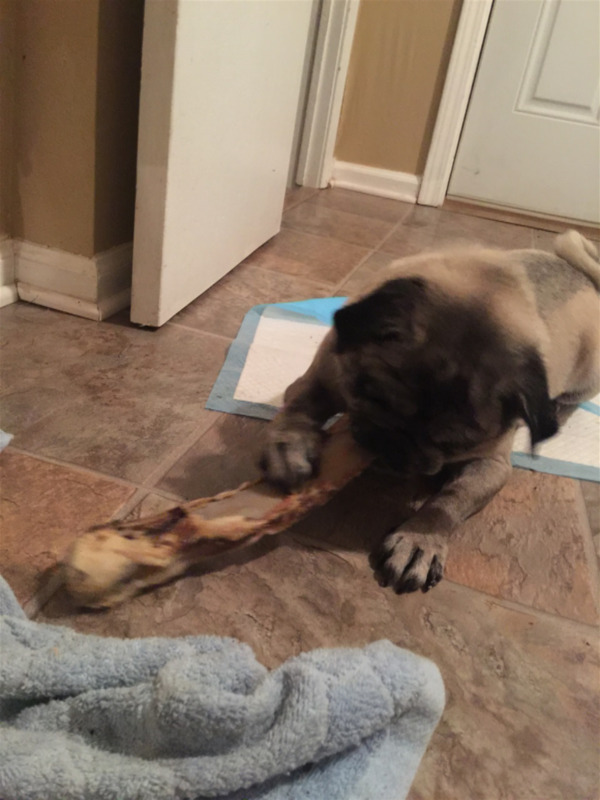 Lola enjoying her bone in foster care with us. 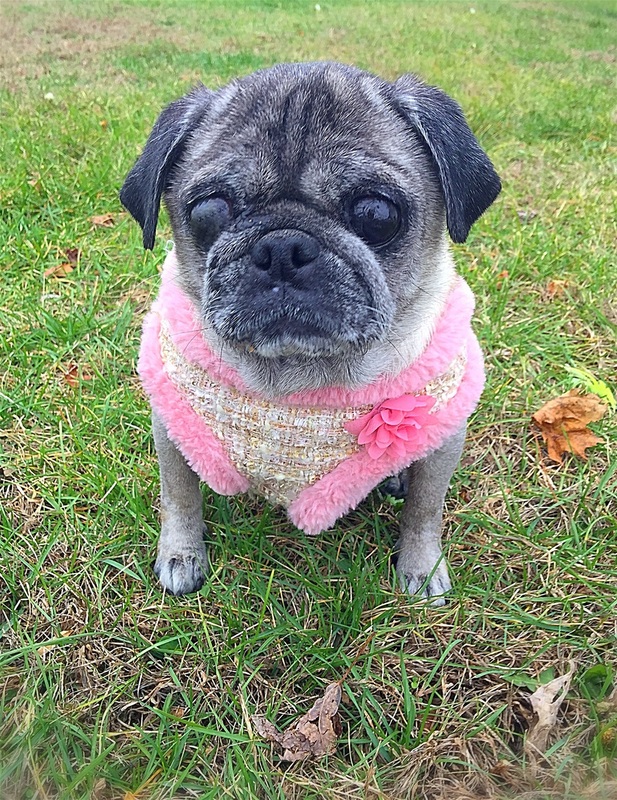 Lola is an 8 year old pug that developed dermatitis, cataracts and a severe case of diabetes that the vet was having a hard time regulating, even with insulin. 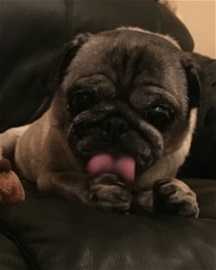 Lola's sister also developed a severe case of diabetes and previously passed away under the vet's care since her blood sugar could not be regulated either. Lola's pet parents had their own health issues and with the constant vet visits back and forth trying to regulate Lola's blood sugar along with her accidents in the house (due to her diabetes) was more than they could handle. At this point they decided that it would be best to have Lola put to sleep because they didn't have any other options - so they thought. When the daughter Lina, learned what her parents plan was about euthanizing Lola, she stepped in and sent a plea for help to numerous rescues. 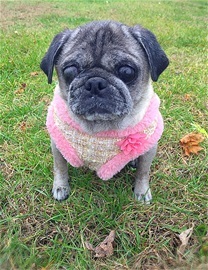 Her email explained about Lola's health conditions and about how she had minimal time to find Lola a rescue. I of course knew that I could heal Lola and find her a loving home so I responded with open arms. It was also a concern of mine that if I didn't respond and another rescue took Lola, they would continue the madness with western medicine and she would soon pass away from complications as her sister did. (I later found out that I was the only crazy person who even responded and offered to take Lola in ). Lina excitedly drove Lola over two hours to my house along with all her doggy supplies. I have to say she was one of the most grateful people I've ever encountered for having helped their family pet. I must add that she herself would have taken Lola if she could but she was living in a small apartment with a dog and two cats of her own. So, to add a diabetic nearly blind dog that could not hold her urine was just not a possibility. Lola came to me with her glucose in the 500's, dripping urine all over in addition to going #1 and #2 right on the floor. Her eyesight was also so bad that she would walk into the wall, parked cars, our legs, etc. 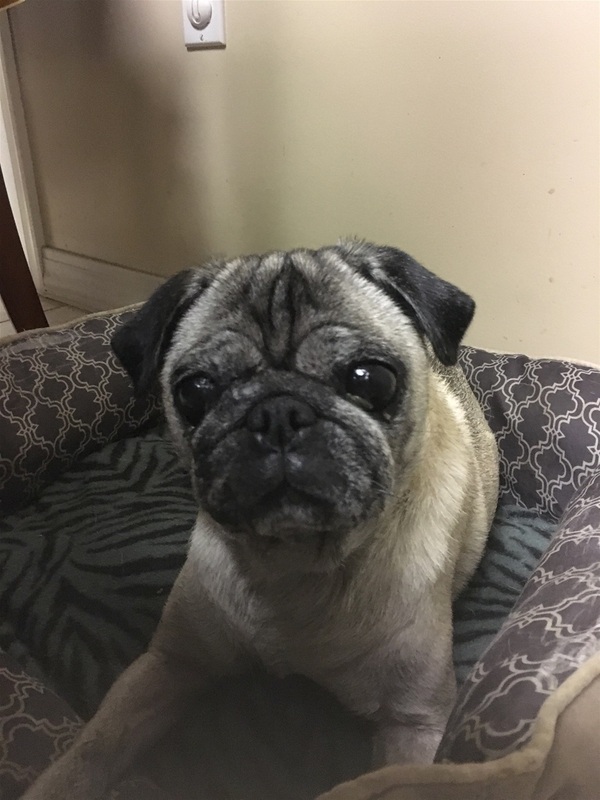 I immediately changed Lola's diet and started her on mega doses of a full spectrum nutrient regimen and extra's for her conditions--blood sugar support, digestive support, eye nutrients etc. as well as a detox program. Within 3 weeks Lola's blood sugar went from the mid 500's to the mid 90's! (I had a glucose monitor at home so I was able to lower her insulin as her numbers dropped). 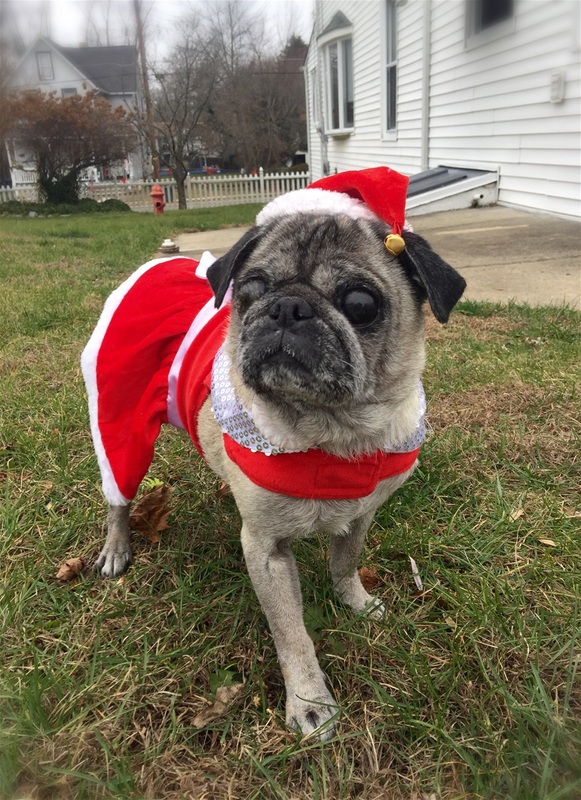 At this point Lola was no longer diabetic and she was able to hold her urine until it was time to go outside. The only thing left was to work on healing her eyes but this could be done in a new home as this would take extensive time. 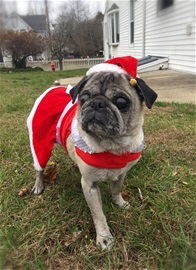 I added Lola to our adoption sites and the inbox was flooded with adoption applications for her! A few deciding factors for Lola's new home was that they were local and that they would continue to feed her the recommended food as well as keep her on the nutrients for life. Many homes did not understand the correlation and importance of the nutrients and so I knew those particular homes would not be in Lola's best interest. We had to find her a home that had some understanding in nutrition and natural health and wanted to continue the healing process. The search for the right family wasn’t hard at all. A few weeks later I delivered Lola to her new home a few miles away. Her new family was ecstatic and was an absolute perfect fit! As of today Lola continues to thrive in her new home.